In today's Guardian Paul Dacre made an attempt to defend Geoffrey's Levy's attack on Ralph Miliband. "Surely, we reasoned, the public had the right to know what influence the Labour leader's Marxist father, to whom he constantly referred in his speeches, had on his thinking. So it was that Levy's article examined the views held by Miliband senior over his lifetime, not just as a 17-year-old youth as has been alleged by our critics. The picture that emerged was of a man who gave unqualified support to Russian totalitarianism until the mid-50s, who loathed the market economy, was in favour of a workers' revolution, denigrated British traditions and institutions such as the royal family, the church and the army and was overtly dismissive of western democracy. Levy's article argued that the Marxism that inspired Ralph Miliband had provided the philosophical underpinning of one of history's most appalling regimes – a regime, incidentally, that totally crushed freedom of expression." Of course it is completely untrue that Ralph Miliband "gave unqualified support to Russian totalitarianism until the mid-50s." Miliband was in fact one of the leading Marxist critics of the Soviet government during this period. As his biographer, Michael Newman, has pointed out: "Miliband was... politically homeless in post-war Britain. He regarded himself as a Marxist, but was increasingly critical of the Soviet Union and Communist Party allegiance to it. He had several friends in the Labour Party, but there is little to suggest that he had any great enthusiasm for it and, in any case, the Labour Left seemed extremely weak." In 1968 he wrote to his great friend, Marcel Liebman: "The invasion of Czechoslovakia show very well that this oppressive and authoritarian Russian socialism has nothing in common with the socialism that we demand, and we must state this very loudly, even at the risk of seeming to be anti-soviet and to echo bourgeois propaganda." Dacre's claims that "the Marxism that inspired Ralph Miliband had provided the philosophical underpinning of one of history's most appalling regimes – a regime, incidentally, that totally crushed freedom of expression" is of course ridiculous. But what about the owner of the Daily Mail who championed Adolf Hitler in the 1930s? Was he not "underpinning of one of history's most appalling regimes"? The liberal press has made the point several times over the last couple of weeks about the articles published by Lord Rothermere in the lead up to the Second World War. However, no references have been made to the treasonous letters he sent to Hitler during this period. These were released by MI5 in 2005. However, it was several years earlier that the FBI made their files available on Lord Rothermere. Surprisingly, the national press don't seem very interested in this story. However, it is one of the most interesting stories of the war. The story begins in 1927. At that time Rotheremere's personal wealth was around £25 million and he was estimated to be the third richest man in Britain. Rothermere spent three months of the year gambling in Monte Carlo. It was here he met Princess Stephanie von Hohenlohe in 1927. According to a FBI file, Stephanie had targeted Rothermere. It said that "she was reputedly immoral, and capable of resorting to any means, even bribery, to get her ends." They both enjoyed gambling and she described Rothermere as "a fabulous plunger at the casino tables". Princess Stephanie persuaded Rothermere that the defeated nations had been badly treated by the Treaty of Versailles. Rothermere was impressed by her arguments and her understanding of the problem. Rothermere agreed to write an editorial on the subject. On 21st June, 1927, The Daily Mail argued: "Eastern Europe is strewn with Alsace-Lorraines. By severing from France the twin provinces of that name the Treaty of Frankfurt in 1871 made another European war inevitable. The same blunder has been committed on a larger scale in the peace treaties which divided up the old Austro-Hungarian Empire. They have been created dissatisfied minorities in half a dozen parts of Central Europe, any one of which may be the starting point of another conflagration." In 1931 Princess Stephanie now moved to London where she took an apartment on the sixth floor of the Dorchester Hotel. An American banker, Donald Malcolm, spent a great deal of time with Stephanie and advised her to negotiate a contract with Rothermere. According to Jim Wilson, the author of Nazi Princess: Hitler, Lord Rothermere and Princess Stefanie Von Hohenlohe (2011): "Clinching the contract was not difficult to achieve. She reminded Rothermere of the success of her intervention over Hungary, and persuaded the press baron to appoint her as his emissary in Europe. She argued - and this was undoubtedly true - that she had the contacts to gain admittance to many of Europe's most powerful people, and that she could open doors to almost every exclusive social circle on the Continent." It was later revealed that Rothermere paid the Princess Stephanie £5,000 a year (equal to £200,000 in 2013) to act as his emissary in Europe. In November, 1933, Lord Rothermere gave Princess Stephanie von Hohenlohe the task of establishing personal contact with Adolf Hitler. Princess Stephanie later recalled: "Rothermere came from a family that had experienced the novel possibility of influencing international politics through newspapers and was determined to sound out Hitler." Stephanie went to Berlin and began a sexual relationship with Captain Fritz Wiedemann, Hitler's personal adjutant. Wiedemann reported back to Hitler that Stephanie was the mistress of Lord Rothermere. Hitler decided that she could be of future use to the government and gave Wiedemann 20,000 Reichsmarks as a maintenance allowance to ensure that she had her hotel, restaurant bills, telephone bills and taxi and travel fares paid. Wiedemann was also allowed to buy her expensive clothes and gifts. The following month Wiedemann arranged for Princess Stephanie to have her first meeting with Hitler. According to Jim Wilson, the author of Nazi Princess: Hitler, Lord Rothermere and Princess Stephanie Von Hohenlohe (2011): "The Führer appears to have been highly impressed by her sophistication, her intelligence and her charms. At that first meeting she wore one of her most elegant outfits, calculating it would impress him. It seems to have done so, because Hitler greeted her with uncharacteristic warmth, kissing her on the hand. It was far from usual for Hitler to be so attentive to women, particularly women introduced to him for the first time. The princess was invited to take tea with him, and once seated beside him, according to her unpublished memoirs. Hitler scarcely took his piercing eyes off her." Lord Rothermere sent Princess Stephanie back with a gift for Hitler. It was a portrait photograph of Rothermere, mounted in a solid gold frame, made by Cartier of Paris and worth more than £50,000 at today's prices. On the reverse of the frame was a reprint of the page from The Daily Mail of 24th September 1930, which reproduced Rothermere's initial editorial, hailing the success of Hitler in the General Election. Hitler was delighted as Rothermere was clearly delivering the propaganda he sought. In August 1934 Princess Stephanie von Hohenlohe wrote a letter to Rothermere asking him to meet Hitler: "Please let me impress upon you that you ought to see H (Hitler) now. I know he already has some doubts as to your sincerity. I hope you have not forgotten that you assured him in your last letter you would see him in the latter part of August... He intends to discuss his present and future plans with you, and I think it is, for the first time, more in your interests than his, for you to see him." Rothermere made his first visit to Adolf Hitler in December 1934. He took along with him his favourite journalist on The Daily Mail, the veteran reporter, George Ward Price. At the first meeting Hitler told Rothermere that "Lloyd George and your brother won the war for Britain. This was a reference to the Prime Minister David Lloyd George and Lord Northcliffe, who it was claimed made sure that the British Army received enough munitions on the front-line during the later stages of the First World War. That evening Hitler held his first major dinner party he had given for foreign visitors at his official residence in Berlin since he had taken office. The high-level guests included Joseph Goebbels, Hermann Goering and Joachim von Ribbentrop. On 20th December, 1934, Lord Rothermere returned the hospitality, hosting a dinner at Berlin's famous Hotel Adlon. Princess Stephanie von Hohenlohe was placed in charge of the arrangements. Twenty-five guests attended including Adolf Hitler, Germany's Foreign Minister Konstantin von Neurath, Joseph Goebbels, Magda Goebbels, Hermann Goering, accompanied by the actress Emmy Sonnemann. Also invited was British banker E.W.C. Tennant, one of the principal founders of the Anglo-German Fellowship. 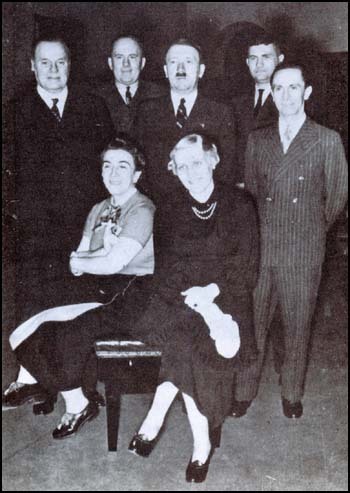 As Richard Griffiths, the author of Fellow Travellers of the Right (1979) has pointed out: "Rothermere visited Hitler on a number of occasions, and corresponded with him. As we have seen, Hitler's first major dinner party for foreigners, on 19th December 1934, had as its guests of honour Rothermere, his son Esmond Harmsworth, and Ward Price, together with Ernest Tennant. Rothermere's subsequent article in the Daily Mail was violently enthusiastic about what Hitler had done for Germany. Hitler wrote a number of important letters to Rothermere in 1933 and 1934, but the most interesting of them, because of its subsequent fate, was the one written on 3 May 1935 in which he advocated Anglo-German understanding as a firm combination for peace. Rothermere circulated this to many politicians, convinced that his personal contact with Hitler had produced a real breakthrough." Lord Rothermere met Adolf Hitler again in September 1936. On his return he sent Princess Stephanie von Hohenlohe to Berlin with a personal gift of a valuable Gobelin tapestry (worth £85,000 today). In a letter accompanying his gift, Rothermere wrote that he had selected the tapestry guided by the thought of Hitler the "artist", rather than Hitler the "great leader". Rothermere added that he was pleased to hear from Stephanie that "he was in high spirits and excellent health". He signed off the letter "in sincere admiration and respect". Lord Rothermere, Princess Stephanie and George Ward Price were invited to spend time with Hitler at his holiday retreat, The Eagle's Nest, in the mountains above Berchtesgaden. Also invited was Joseph Goebbels. He wrote in his diary: "Rothermere pays me great compliments... Enquires in detail about German press policy. Strongly anti-Jewish. The princess is very pushy. After lunch we retire for a chat. Question of Spain comes up. Führer won't tolerate a hot-bed of communism in Europe any longer. Is ready to prevent any more pro-Republican volunteers from going there. His proposal on controls seem to astonish Rothermere. German prestige is thus restored. Franco will win anyway... Rothermere believes British government also pro-Franco." Adolf Hitler was kept informed about what British newspapers were saying about him. He was usually very pleased by what appeared in The Daily Mail. On 20th May 1937 he wrote to Lord Rothermere: "Your leading articles published within the last few weeks, which I read with great interest, contain everything that corresponds to my own thoughts as well." Hitler told George Ward Price: "He (Lord Rothermere) is the only Englishman who sees clearly the magnitude of this Bolshevist danger. His paper is doing an immense amount of good." Hitler remained fascinated with Princess Stephanie and gave her the magnificent palace, Schloss Leopoldskron, that had been confiscated from Max Reinhardt, who had fled from Austria in 1937 after criticising the Nazi government. Hitler wanted her to use it as a home and a "political salon". One of the first people she tried to entertain in the palace was Lord Runciman, the man who had been appointed by the British government as its official mediator in the dispute between the Czech and German governments over the Sudetenland. Hitler had personally pinned on her the Nazi Party's Gold Medal of Honour. According to Jim Wilson, the author of Nazi Princess: Hitler, Lord Rothermere and Princess Stephanie Von Hohenlohe (2011): "In the Third Reich it was a badge that elevated the recipient to the level of 'Nazi royalty'. It was rarely awarded and reserved for a small group of people, mainly long-standing Nazi Party members who had given outstanding service to the National Socialist movement. It was regarded as the mark of a so-called true patriot." Princess Stephanie however was beginning to have doubts about Adolf Hitler. In a letter written to Lord Rothermere on 2nd February, 1938, she argued for him to change his policy towards Nazi Germany: "It is important to know what is currently going on in Germany. The Germans are going through a serious crisis. Changes are taking place, which are of the greatest importance for the future of Europe. All the conservatives are being thrown out and only extremists are keeping their jobs or being recruited. You must be very careful in future. I do not see how it will be possible for you, under these new conditions, to continue to support Hitler in future and at the same time serve the interests of your own country." Lord Rothermere refused to take her advice and continued to give his support to the Hitler. Lord Rothermere and his newspapers promoted Neville Chamberlain and his policy of appeasement. When Hitler marched into Czechoslovakia in March 1938 he sent a telegram to Adolf Hitler saying: "My dear Fuhrer everyone in England is profoundly moved by the bloodless solution to the Czechoslovakian problem. People not so much concerned with territorial readjustment as with dread of another war with its accompanying bloodbath. Frederick the Great was a great popular figure. I salute your excellency's star which rises higher and higher." At the end of 1938 Adolf Hitler began to turn against Princess Stephanie. Officially it was because he had discovered that she was Jewish. However, he had in fact known about this for at least three years. Hitler told Fritz Wiedemann that he should break off all contact with her. Leni Riefenstahl suggested that Wiedemann's "relationship with Hitler became more distant because of his half-Jewish girlfriend." Joseph Goebbels commented in his diary in January 1939: "Princess Hohenlohe now turns out to be a Viennese half-Jewess. She has her fingers in everything. Wiedemann works with her a great deal. He may well have her to thank for his present predicament, because without her around he probably would not have made such a feeble showing in the Czech crisis." In January, 1939, Princess Stephanie decided to move to London and resumed contact with Lord Rothermere. He gave her a cheque for £5,000 and told her that the contract had come to an end. Rothermere continued to write to Hitler and other leading Nazis. On 7th July 1939, Rothermere wrote to Joachim von Ribbentrop: "Our two great Nordic countries should pursue resolutely a policy of appeasement for, whatever anyone may say, our two great countries should be the leaders of the world." In January, 1939, Princess Stephanie decided to move to London and resumed contact with Lord Rothermere. He gave her a cheque for £5,000 and told her that the contract had come to an end. Rothermere continued to write to Hitler and other leading Nazis. On 17th June, 1939, he told Hitler: "My dear Führer. I have watched with understanding and interest the progress of your great and superhuman work in regenerating your country." On 7th July 1939, Rothermere wrote to Joachim von Ribbentrop: "Our two great Nordic countries should pursue resolutely a policy of appeasement for, whatever anyone may say, our two great countries should be the leaders of the world." In March 1939 the MI6 passport control officer at Victoria Station arrested Princess Stephanie's Hungarian lawyer, Erno Wittman. The arresting officer reported what he discovered that Wittman was carrying: "This was astonishing; it appeared to be copies of documents and letters which passed between Lord Rothermere, Lady Snowden, Princess Stephanie, Herr Hitler and others. In the main, the letters referred to the possible restoration of the throne in Hungary and shed a good deal of light on the character and activities of the princess." It was decided to pass on this information to MI5. Amongst the documents were several letters from Lord Rothermere to Adolf Hitler. This included a "a very indiscreet letter to the Führer congratulating him on his walk into Prague". The letter urged Hitler to follow up his coup with the invasion of Romania. It seems that Adolf Hitler had given Princess Stephanie photocopies of the letters Lord Rothermere had been sending him. As Jim Wilson, the author of Nazi Princess: Hitler, Lord Rothermere and Princess Stephanie Von Hohenlohe (2011) has pointed out: "These letters were secretly circulated within the intelligence services and senior civil servants in key government ministries... Nothing could be more revealing of the press baron's continued support of the Nazi Führer as the inevitable conflict drew closer, but it appears MI5 shied away from actually taking action against the press baron. Certainly there is nothing in the derestricted files to indicate whether Rothermere was warned to cease his correspondence with Berlin, though some information in the files still remains undisclosed.... The MI5 makes it clear that the secret service had warned the government that copies of this correspondence would be produced in open court, which would embarrass not only Rothermere but also a number of other notable members of the British aristocracy, and that these disclosures would shock the British public." 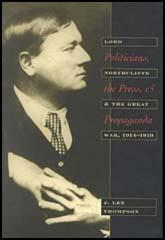 On 24th September 1939 Lord Rothermere had his close colleague and "ghost", Collin Brooks, draft a letter to Neville Chamberlain urging the futility of trying to save Poland and warning that "whether victorious or not, Britain will emerge from such a conflict with her social and economic fabric destroyed", which could mean "a revolution of the Left in these islands, which might be more deadly than the war itself". According to Rothermere's biographer, D. George Boyce: "But the letter was never sent (despite Rothermere's fear that Britain was ‘finished’), because of the ‘national mood and temper’, a nice example of the would-be opinion leader and press baron being led by the public itself." Three weeks after the outbreak of the Second World War Rothermere's lawyers attempted to have the legal action stopped. A member of his law firm went to the Home Office and denounced Princess Stephanie as a German agent and suggested that she should be deported. If the case reached open court it would receive huge publicity and would undermine public morale. However, the Home Office came to the conclusion that it would be improper to intervene. The case reached the High Court on 8th November, 1939. Princess Stephanie's case was that in 1932, when Rothermere had promised to engage her as his European political representative on an annual salary of £5,000, she had understood the engagement was ongoing. She made it clear to the judge that if she lost the case she would not hesitate to publish her memoirs in America. This story would reveal Lord Rothermere's relationship with Hitler and his "numerous, often indiscreet, liaisons with women". Sir William Jowitt asked Princess Stephanie if she had used the services of Fritz Wiedemann to put pressure on Lord Rothermere. She replied: "I have not." Then a letter from Wiedemann to Lord Rothermere was read out in court. It included the following passage: "You know that the Führer greatly appreciates the work the princess did to straighten relations between our countries... it was her groundwork which made the Munich agreement possible." Lord Rothermere, who had engaged a legal team of seventeen to mount his defence, told the judge, it was preposterous that he had agreed to support Princess Stephanie "for the rest of her life". He admitted that between 1932 and 1938 he had paid her considerably more than £51,000 (almost £2 million in today's money). He added that she was always "pestering and badgering me" for money. That is why he sent her away to Berlin to be with Hitler. Jowitt told the court that Princess Stephanie had his client's letters photocopied behind his back by the Special Photographic Bureau of the Department of the German Chancellor. He also defended Rothermere's right to enter into negotiations with Hitler in an effort to prevent a war between the two countries. "Who can say whether if Lord Rothermere had succeeded in the endeavours which he made, we might not be in the position in which we are today." After six days of legal argument Justice Tucker ruled against Princess Stephanie. Soon after the trial finished, Lord Rothermere used Lady Ethel Snowden as an intermediary and sent Stephanie a message to say he would meet all her legal costs if she undertook to get out of the country. This she agreed to do but he thought she was going back to Europe instead of going to the United States to publish her account of her relationship with Rothermere. However, he was able to use his considerable power to make sure her memoirs were never published. In the House of Commons the Liberal Party MP, Geoffrey Le Mesurier Mander, asked the Home Secretary, Herbert Morrison, why Princess Stephanie, a "notorius member of the Hitler spy organisation" was being allowed to leave the country. Morrison replied that he needed notice of the question but in any case she had been granted only a "no return" permit and there were no circumstances in which she would be allowed to return to Britain. Lord Rothermere was now aware that MI5 had copies of his letters to Adolf Hitler. Fearing that he might be arrested for treason and decided to go and live in Bermuda where he died on 26th November 1940.